If you can believe it, I am a relative newbie to shawl knitting. I t really wasn’t until early last year, when I started to listen to Knitting Pipeline, my very first knitting podcast. (See, this is what happens if you’ve been knitting for a very long time like me — you have missed the last 5 years of knitting boom. It has been simply amazing!) She spoke about the Kaellingesjal shawl, which is a recreation of a 1897 shawl from the Vendsyssel Museum in Denmark. It’s a working woman’s shawl, with a tie that wraps around the body. I was so enthralled by Paula — but was a bit reticent to cast on a big project. 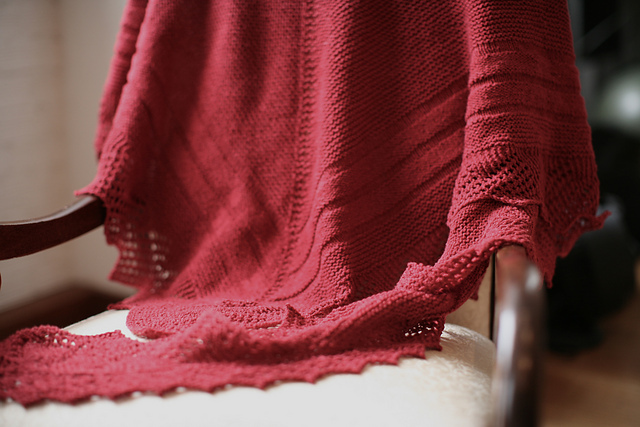 So I cast on Summer Flies as a “test” (I highly recommend, if you’ve never knit a shawl, to try this free pattern. 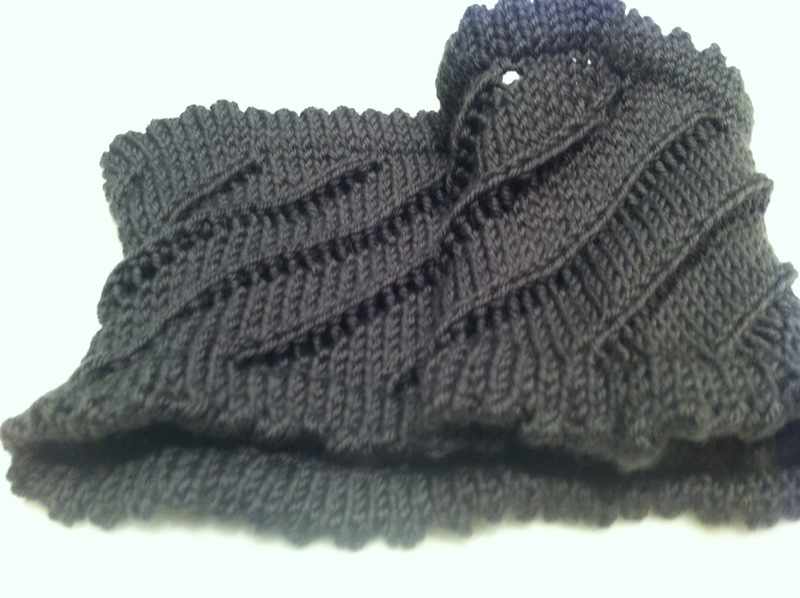 It’s an amazingly fun knit), and I finished it in ….a DAY. I cast on for Kaellingesjal the next day. You can check it out on my Ravelry project page. I started the shawl on 2/14/11 (Happy Valentine’s Day!!) and finished it on 3/20/11. 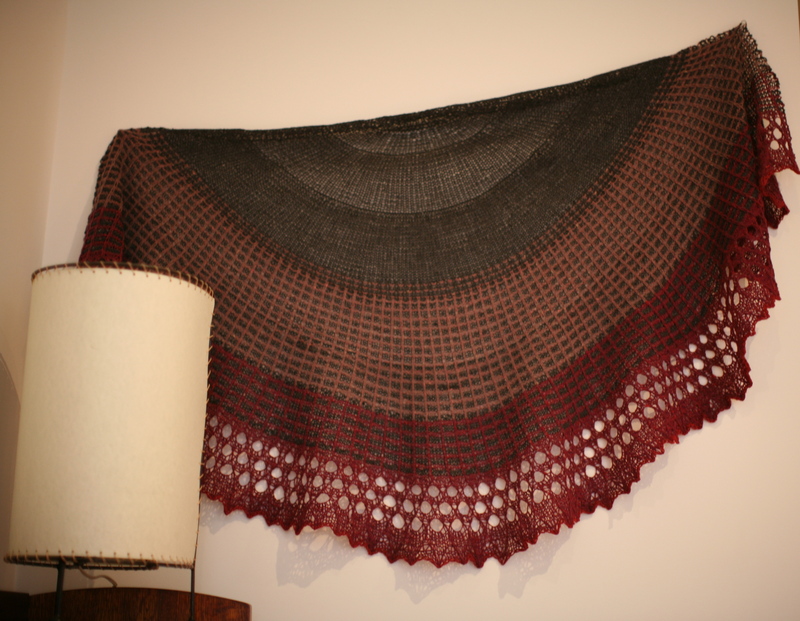 I kept on listening to Paula, and the next shawl she mentioned was Brandywine. 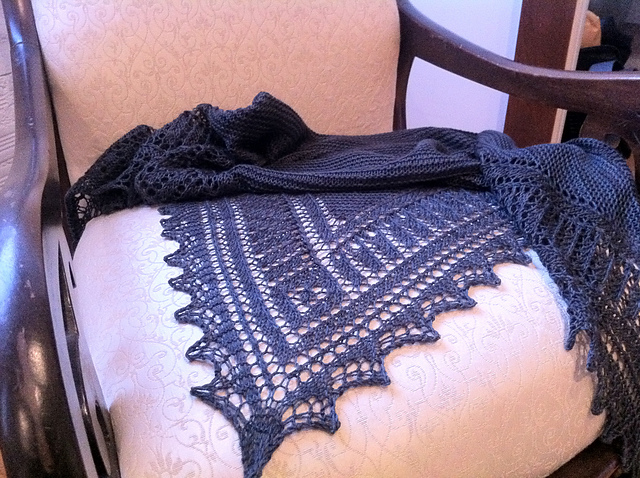 This was my first Romi Hill shawl. I put this shawl on my needles on 3/20/11 (sense the start of what may be happening here already!?!? ), and finished it in a couple of weeks. And I was hooked. Since then, I have knit 43 shawls (so 47 in total), of which 15 are Romi’s designs. OK. These numbers are scaring me a little. I sound like a woman obsessed. Oh well. I guess I will just own the fact that I love to knit shawls. You don’t have to worry about sizing, they are wonderful gifts, and you just can’t have too many. So….the reason why I’m posting today. My Shawl Number Twenty Six for 2012. 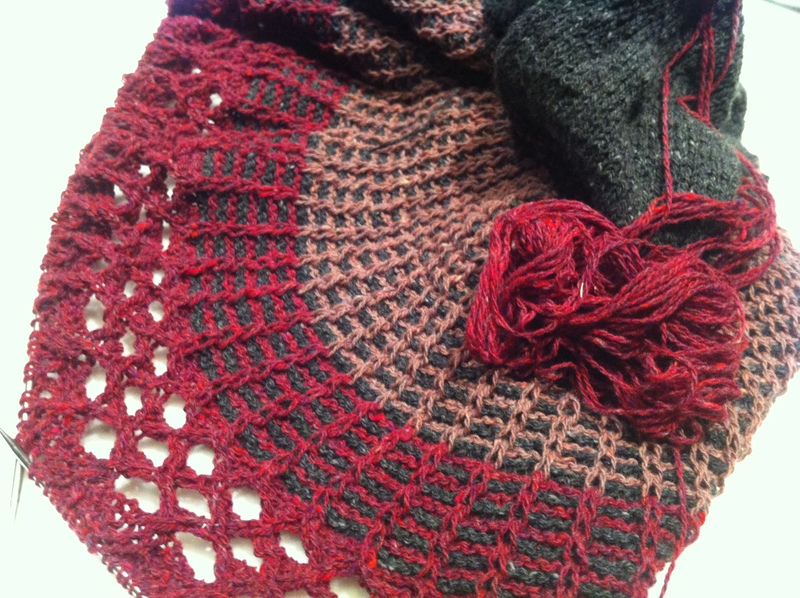 Meet Romi Hill’s Carson, knit out of stash Rowan tweedy wooly yarn! WIP Wednesday: It’s Month End — Race to The Finish! I participate in the Harry Potter Knitting and Crochet House Cup (HPKCHC) on Ravelry, where I am a member of Slytherin House. As we near the end of each month, I put on the jets to finish the projects that I intend to finish for the monthly classes. My goal this term is to hand in at least one sweater a month, and for the longer term projects (O.W.L. and Order of the Phoenix), I am also doing sweaters. My rationale is that instead of knitting small projects and handing in many classes, I should try to maximize the bonus points (while I don’t know how bonus points are calculated, I know there are bonus points for yardage). I have been told, after all, that I am a fast knitter and I think that in the end, perhaps I will end up amassing more points than I would have had I handed in small projects. This term, I have already handed in two items so far. My Levenwick sweater, and the SSSSpiral Cowl. I’m working on two more things that I hope to complete by Sunday. First, Romi Hill’s Carson. Carson is the first in this year’s Small Shawls Collection. 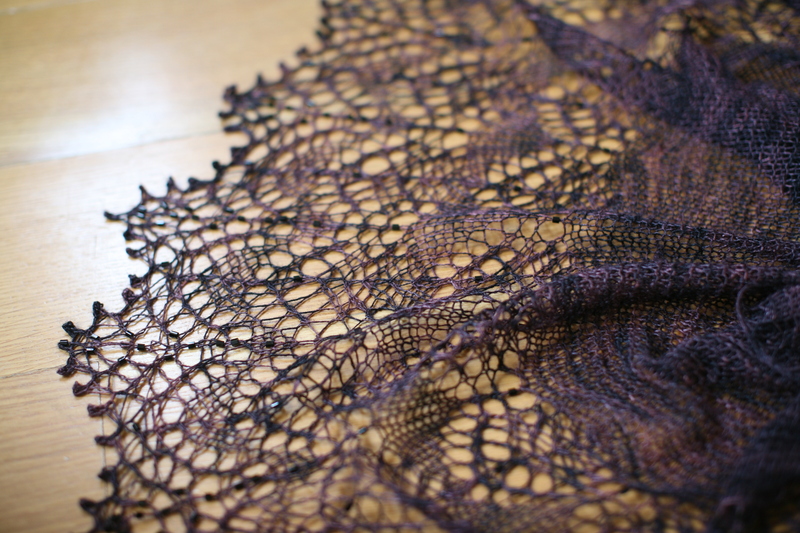 I got this shawl on the needles as soon as I cast off Rosa Flora. When I saw the pattern, I knew I wanted to knit mine in something tweedy. Being totally virtuous on this project, I decided to use Rowan Yorkshire Tweed 4-ply that I have had in my stash since either 2004 or 2005 (since the yarn has been discontinued since then, I’m pretty sure it’s that old!). I have oodles of this stuff, but the trick was to find the colors that I have enough of and would work in a multi-color shawl. As you can see from the photo, I’m just a few rows away from binding off. I am probably going to have to introduce another color for the last few rows so that will be a bit tricky. 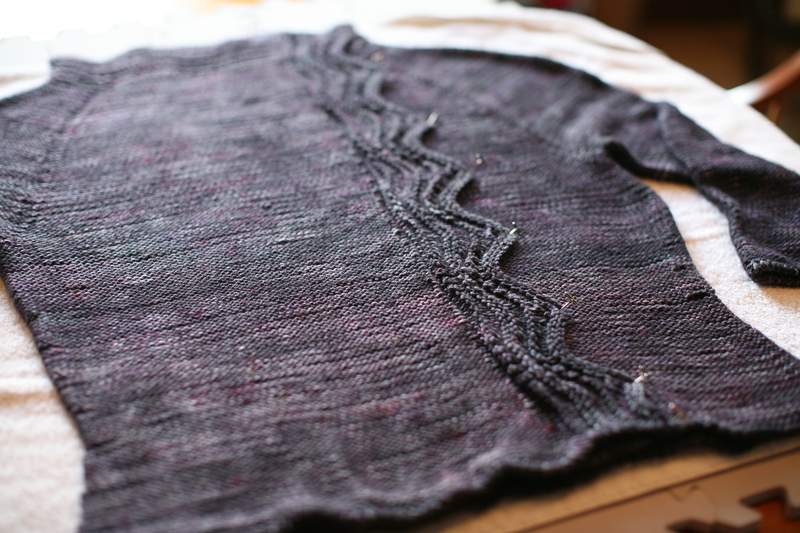 I think I will be able to finish knitting this shawl, block it, and photograph it by the end of the weekend. Second, I am also in pretty good shape on Cookie A’s Conic. 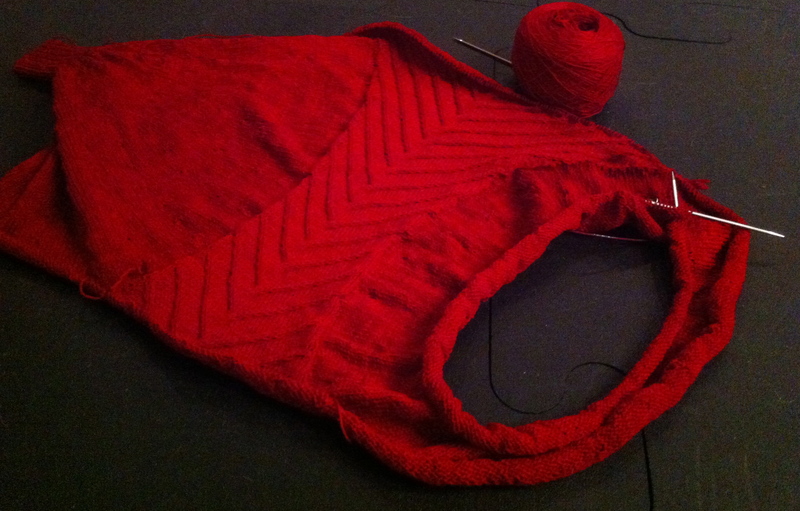 I’m knitting this out of Wollmeise 100% in Ruby Thursday. This sweater is such a fun knit. At first, I wasn’t sure about knitting this. I fell in love, though, when I read Cookie A’s blog post about this shrug. I think it is genius how versatile this shrug is, and how great it looks on so many body types. I think I can throw this on over a shift and be completely work-worthy!!! I’m on sleeve #2, but after I finish that (the total beauty of the construction….you decrease 20 stitches every 9 rows. It gets smaller and faster!!! ), I have to pick up >450 stitches and knit 2×2 rib for 3 inches so I will likely be cutting it relatively close on finishing this by Sunday. Of course, if I finish with time to spare, I will be working on my O.W.L. sweater, or Waterfall. I know. I’ve not told you what my O.W.L. sweater is. I will. Soon. Any deadline knitting on your needles? Shetland Trip: Foula. I Thought It was Just a Remote Island.